Since that tragic moment we all learned that our Princess, Carrie Fisher, had passed on to something better, outside of mourning, we’ve questioned how the character of Leia Organa would be pushed forward in the Star Wars galaxy. There have been many theories, ideas and possible ways it could happen, and even with Lucasfilm officially cancelling out the CGI route, it was still the biggest question in this franchise. Luckily for us, the studio has answered that question as they’ve revealed the official cast and start date for J.J. Abrams’ untitled Star Wars: Episode IX. As StarWars.com reveals, Episode IX will officially begin filming next week at Pinewood Studios in London, the home of all of Star Wars filming. Abrams is directing a screenplay that he co-wrote with Chris Terrio (Argo, Batman v Superman: Dawn of Justice). The kicker here is how the press release was worded, as they said: “J.J. Abrams returns to direct the final installment of the Skywalker saga.” The final installment of the Skywalker saga? Let the fanboy cries for help commence! More on this later on. It’s pretty genius of Abrams and the studio to do this. Not only will it make Star Wars fans everywhere extremely happy, it’s the best decision the studio has made in months. An off-screen death would have been wrong, and recasting or using a CGI effect a la Tarkin in Rogue One would have felt out of place. 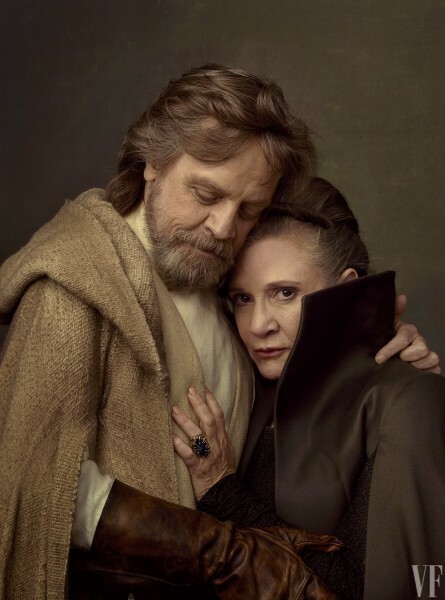 With unused footage at their disposal, and what I’m guessing is a lot of it, they can now place Fisher and her Leia perfectly into the story. And it’ll allow us fans to witness this beloved character one last time, especially if the Skywalker Saga is coming to a close. For me, the biggest standout of the list of names above is where Mark Hamill’s name is placed. Yes, we all expected it to be included following the ending of The Last Jedi, but especially with J.J. Abrams returning to direct. But these press releases are written out and checked multiple times, meaning everything is where it’s suppose to be. Daisy Ridley’s Rey and Adam Driver’s Kylo Ren are the pivotal piece of these new movies, which is why they’re leading the entire cast. So why is Hamill’s name leading the veteran cast? There’s only one answer, his role is just as sizable as it was in The Last Jedi. Whaaaat? Yeah, you read that write. Although Luke sacrificed it all and drifted away as the most legendary Jedi to ever live, The Last Jedi proved that force ghosts aren’t just ghosts; they can actually interact with the real world. If Episode IX keeps with the theme of breaking the previous boundaries/rules, Abrams could introduce us to more extremely interesting force mythology ideas. Hopefully we’ll know more soon. All the names above will also be joined by Star Wars newcomers Naomi Ackie, Richard E. Grant, and Keri Russell, whose roles have yet to be revealed. And what may be the final time, John Williams will be scoring the film. As I said with the handling of Carrie Fisher, it just feels right. What do you think of this news? How do you feel about the Carrie Fisher reveal? Am I looking too far into Mark Hamill? Sound off below in the comments! Abrams’ Star Wars: Episode IX will be released in December 2019.